It's happened to every parent: you buy little Sammy the hottest new toy, and he's more excited to play with the box it came in and the Styrofoam peanuts. But Rockwell didn't want to limit the fun to just one place. So he came up with a portable version that is meant to complement existing play structures, not replace them. Through a partnership with kid-focused nonprofit Kaboom!, Imagination Playground in a Box is expected to arrive at more than 1,000 parks and schools nationwide within the next five years. "Demand is also tremendous from day-care centers, pediatricians' offices and children's museums," says Kaboom! founder Darrell Hammond. "This could fundamentally change adults' ideas of how children play." But accessibility does carry a higher price tag. Leone acknowledges that Boundless Playgrounds do cost a community more. The organization raised more than $2.5 million last year to help defray the additional expenses in several municipalities. Rockwell and Kaboom! are exploring how royalties from the Imagination Playground in a Box  the portable wonderlands cost approximately $6,500 a pop  can fund an endowment to cover one rather significant, ongoing cost: a paid Play Associate, i.e., a trained adult who can help direct play while ensuring that those loose parts don't go missing. "It's a model we've borrowed from England," Rockwell says. "That person is in charge of fostering collaboration and creativity." 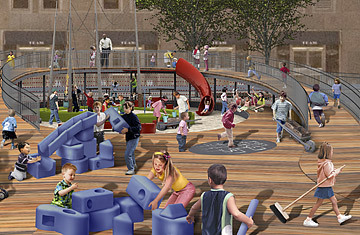 At its core, Rockwell's Imagination Playground simply gives children more stuff to do with sand and water. "Kids need to dig in the dirt, take risks, fall down and get back up," Benepe says. "That's the only way to teach them how to work together and build the great cities of the future." Or, at the very least, the next cool playground. Read TIME's 1965 article "Junkyard Playgrounds."